This ever popular Aspen hotel was built in 1889 by Jerome Wheeler, one of the owners of the famous Macy’s department store in New York and was designed to offer some of the cosmopolitan feel found in Europe at the time. This hotel is the one to go to if you would like to stay in an older hotel with character and for a bit of nostalgia. The hotel is centrally located and everything you need is nearby. The hotel offers several good dining options and has a popular bar on the premises. Each one of the hotel's 94 spacious guest rooms and luxury suites is uniquely decorated and beautifully afforded with indulgent touches. From down comforters, feather pillows, and 300-thread-count linens to bathrooms that include oversized bathtubs, separate showers and double-basin marble vanities, no comfort has been overlooked. Additionally, each room is appointed with amenities including high-speed Internet access, two double-line telephones, digital TV, an iron/ironing board, a humidifier, an electronic safe, and a fully stocked mini-bar to ensure guest satisfaction. The hotel has a fitness centre with cardio and strength equipment, an outdoor heated pool and two jacuzzis. 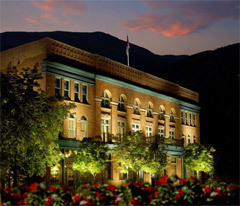 The hotel also offers guests access to the Aspen Club & Spa. The Aspen Club is a private membership club. However guests of the hotel can enjoy club privileges with exclusive membership rates, as well as complimentary transportation to and from the club. The Aspen Club attracts guests looking for fitness, adventure and pampering. The 77,000-square-foot complex features state-of-the-art fitness equipment, the world-renown SpaAspen™ and the internationally recognized Sports Medicine Institute, a healing center that combines time-honored knowledge with contemporary medicine. Aspen Airport, Sardy Field, is a short 10-minute drive from the hotel. The airport offers a year-round schedule of flights, operated by several major airlines and private air companies. Direct flights are available from major cities such as Los Angeles, Phoenix and Denver. The flight from Denver to Aspen is a spectacular 30-minute trip with breathtaking Rocky Mountain views. The hotel offers a complimentary transportation service from Aspen airport. Denver International Airport is approximately 220 miles (approx. 4 hours) from Aspen . DIA serves as a nonstop destination for numerous national and international flights.